I admire the work of missionaries all over the world. I find it fascinating (in fact I was thinking about writing a book about this recently before coming across the video link below) that there are many stories about people in different tribes and countries that have had dreams or visions about someone from far away that would come to see them and tell them of Jesus. Later, that visitor does come and it has a profound impact on the one(s) who experienced the vision or dream. I recall one story about a man who had a dream to go to a certain street corner in his country, some distance away, at a certain time and wait for a particular person. At the same time, that particular person experiences certain circumstances that cause him to go to that one specific location. Call it crazy if you must. I find it quite interesting and beyond the natural realm of experience. I’d be interested to hear anyone else’s stories. Good Sunday morning. There are lots of things that vie for our attention and there are lots of things in life that we seek after, hoping to be satisfied by them. We look for that satisfaction in money and material things, in success, in power, in relationships. Many times, we long for the applause and adulation that people give. I think we all have a “satisfaction center” in our minds and hearts that longs to be completely filled and satisfied. That is why we constantly search for something to make us happy. When we don’t find it, we try to find something else to fill it. For me, the only thing I’ve found that truly satisfies is Jesus Christ. You can read more about the history of this great hymn here. I hope you enjoy the Crab Family’s version of Rhea F. Miller’s song made famous by George Beverly Shea. 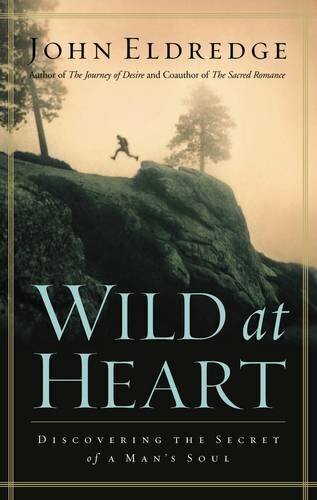 Wild at Heart is a great book. I read it a few years ago and it has continued to impact my life.